Hundreds of Chinese group tourists visited major duty-free shops in Seoul on Tuesday on a scale unseen since Beijing's censure of South Korea last year over the deployment of a US anti-missile system on its soil. Some 820 employees from Chinese cosmetics firm Anya visited a Shilla Duty Free store in Seoul. The Chinese tourists, who arrived in South Korea on Saturday for a five-day trip, also visited Shinsegae Duty Free and SM Duty Free on the same day. 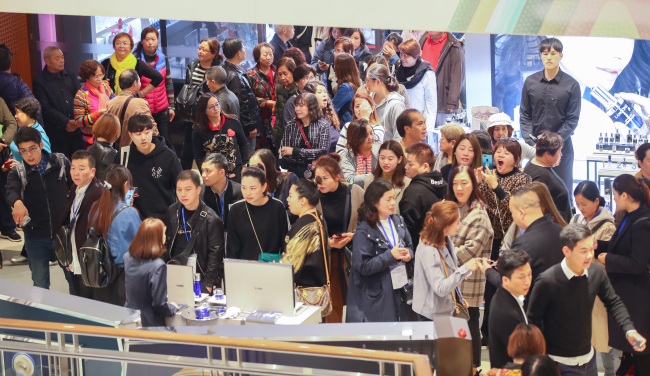 "It is the first time since March of last year that visitors on an incentive tour from China came to the store," a Shilla Duty Free official said. "There have been group tourists from Southeast Asia, but it has been a while since we last saw this scale of visitors arriving on some 20 buses." They are one of the largest groups of Chinese to have visited South Korea since the Beijing government banned the sale of group tour packages in 2017, though this restriction has been partially lifted. China claims the US missile defense system could hurt its security interests. Seoul and Washington have dismissed such concerns, saying the US missile shield is defensive in nature and focuses on North Korea's missile activities. In November last year, Seoul and Beijing agreed to put their bilateral ties back on track, and in a summit a month later, South Korean President Moon Jae-in and his Chinese counterpart, Xi Jinping, agreed to make efforts to improve bilateral relations. Industry watchers predict the number of Chinese visitors will return to its normal level only if the Beijing government lifts other restrictive measures, such as the ban on chartered planes to South Korea.